Being a small business in a competitive field, we really appreciate you choosing and trusting in our design services and referring us to your friends and family. As a token of our gratitude, we would like to send our previous clients* a small, thank you gift for their referrals. 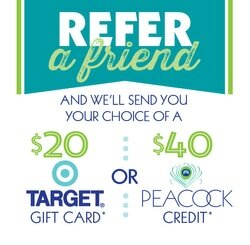 Please fill out a new form for each referral (must be a new client) and read details of offer below. *Note, this program is not for general public referrals. You MUST be a previous client of ours in order to receive a gift. Start with box directly below Mailing Address (which is Line 1). Not all addresses will have a Line 2, so that box can remain empty. ***OFFER DETAILS: For previous clients ONLY. Target© gift card will be mailed or PDP credit will be applied to your account for a future project after a friend (new client only) pays for their order of $400 or more. Voucher is not redeemable for cash. No set expiration date, but PDP has the right to discontinue this gift program at its discretion at any time. This form must be received within 30 days of referral's consultation.